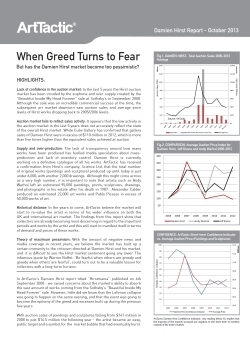 WHEN GREED TURNS TO FEAR. In the last 5 years the Hirst auction market has been clouded by the euphoria and over-supply created by the “Beautiful Inside My Head Forever” sale at Sotheby’s in September 2008. Although the sale was an incredible commercial success at the time, the subsequent art market downturn saw auction sales and average price levels of Hirst works dropping back to 2005/2006 levels. Auction market fails to reflect sales activity: It appears that the low activity in the auction market in the last 5 years does not accurately reflect the state of the overall Hirst market. White Cube Gallery has confirmed that gallery sales of Damien Hirst were in excess of $110 million in 2012, which is more than five times higher than the equivalent sales achieved at auction. Historical distance: In the years to come, ArtTactic believe the market will start to re-value the artist in terms of his wider influence on both the UK and international art market. The findings from this report show that collectors are already becoming more discerning in regard to the important periods and works by the artist and this will start to manifest itself in terms of demand and prices of these works. White Cube Gallery has confirmed that gallery sales of Damien Hirst were in excess of $110 million in 2012, which is more than five times higher than the equivalent sales achieved at auction.